My name is Willow. I was dumped at the shelter hungry, cold and pregnant. I didn't even had time to build a nest. My 7 babies were born on the cold metal floor of my shelter cage. As the days went by I watched my babies go to heaven. Only two survived the ordeal. My precious babies are named Sassafras and Laurel. Thanks to SaveABunny and Rabbit Haven's joint rescue, my family is now safe with my foster dad in San Francisco. He's such a good fosterer of humans and bunnies! My babies are likely to find home because they are cute and sweet. 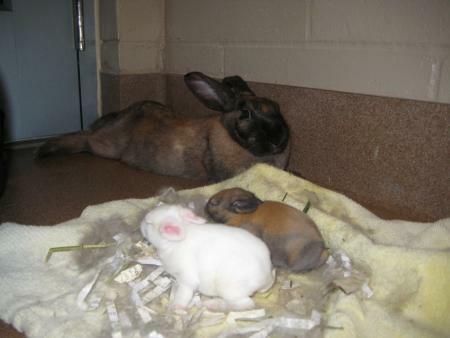 Momma bunnies are often over-looked by adopters as they tend to go for the little ones. I'm looking for a chance to have a loving home too. I'll be lonely after my babies find their new families. I'm a mature bunny who is looking for someone who know how to give me veggie treats when I'm giving them the come hither look and when to let me be the free roaming, independent bunny I want to be. Update 5/2008 - My baby bunnies have been adopted. Thank goodness. I'm still looking for a forever home though. So often people oooh and ahhh over the baby bunnies and the mother's are looked over again and again when it comes to adoptions. Won't you come meet me and give me a chance to find my way into your heart ? I long to live the good life as a companion rabbit. 9/4/2008 - Willow passed away at her foster home today. She was a very good mother bunny and enjoyed her free range foster home. May she run free in fields of tall grass and have a well-stocked garden to forage in on the other side of the rainbow bridge. I'm sure she'll be looking over her little ones. You'll be missed.